April 24, 2012, Vancouver, Canada; El Niño Ventures Inc. ("ELN" and the "Company") (TSX.V: ELN; OTCQX: ELNOF Frankfurt: E7Q) is pleased to provide an update of the exploration work performed during the period July 1 to December 31, 2011 for its Bathurst Mining Camp (BMC) Base Metals Tri-Party agreement between El Nino, Votorantim Canada (VMC) and Xstrata Zinc Joint venture project in Bathurst, New Brunswick. VMC's work on the Xstrata-El Nino-Votorantim lands during this period included diamond drilling and ground EM surveys. A Time Domain EM survey was completed by Eastern Geophysics Ltd. on two third party optioned properties; and a combined borehole and surface TDEM survey was performed southeast of the BM&S No.6. The following table summarizes the work completed during the period July 1 to December 31, 2011. As of December 31, 2011 a total of 16 holes, totaling 5,011 metres, have been completed on the Bathurst Mining Camp project (Figure 1). This Phase of exploration drilling campaign focused on geophysical and geochemical targets in the Brunswick Belt, two third party optioned properties in the Brunswick Belt and two optioned properties in the southwestern part of the BMC. The only hole drilled in the Camel Back project intersected widespread alteration with common traces of sphalerite. A large grid was cut over the two third party optioned properties in Brunswick Belt and adjoining parts of Xstrata's claims. Four loops were laid out and readings were measured in-loop and out-of-loop. Only a few weak areas of low resistivity were detected. Deep drilling, which subsequently tested the at depth extent of a narrow zone of subeconomic base metal mineralization, did not intersect any significant sulphide or base-metal mineralization. Borehole and surface Pulse EM surveys were performed southeast of Nepisiguit Dam in and around two drill holes completed in 2010 that intersected stockwork style copper-iron. Only a small off-hole response was found from the Pulse EM survey at Nepisiguit Dam and no further work is planned. 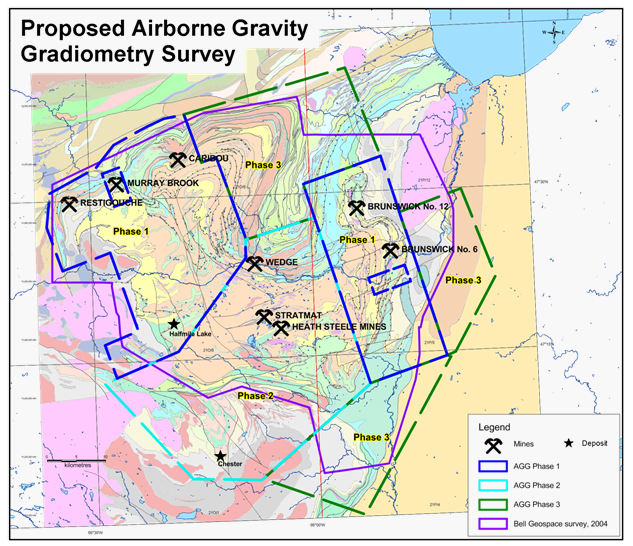 Fugro Airborne Surveys completed the Phase 1 AGG survey over two large areas in the Bathurst Mining Camp in May 2011. This was the first ever commercial survey using the 'Falcon' Gravity Gradiometer in a helicopter platform. Figure 2 shows the outlines of the surveyed areas. A decision to proceed with Phase 2 and 3 will be contingent upon results obtained in Phase 1. Final results have now been received and are being interpreted in conjunction with Votorantim's HeliTEM magnetic and EM data and other historical data, with the objective of identifying targets for drill testing in 2012. 2012-Q1: Three drill holes were completed on third party options, in the Brunswick Belt, for a total of 1975 metres to test for base metal mineralization at depth. No significant mineralization was intersected. These three drill holes as well as three holes completed in Q4 2011 were tested by borehole pulse EM, however no anomalies were detected. 2012-Q2 to Q4 and 2013 Q1: It is planned to drill-test airborne gravity gradiometer targets throughout the remainder of 2012. Ground geophysical surveys will be performed if necessary to refine some gravity targets. Bathurst Mining Camp (BMC) project consists of an initial 4,712 claims in the Tri‐Party Agreement with Xstrata & VM Canada. In January 2009, Votorantim Metals Canada Inc. (VMC) entered into a binding MOU with Xstrata Canada Corporation and El Nino Ventures Inc. to pursue an Option-Joint Venture Agreement, whereby VMC may earn up to a 70% interest in those properties by making exploration expenditures of $20,000,000 over a period of seven years. Following a six-month period of due diligence, the companies entered negotiations to reach a final Option-JV Agreement which was concluded in July 2010. 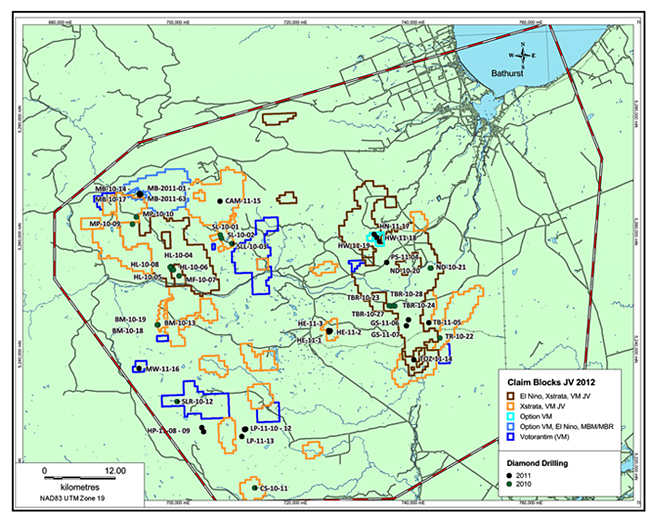 Meanwhile, VMC commenced exploration in August 2009 with a program of airborne and surface geophysical surveys, geochemistry, geological mapping, compilation of historical data and research into advanced exploration technologies suitable for application in the Bathurst Mining Camp (BMC). 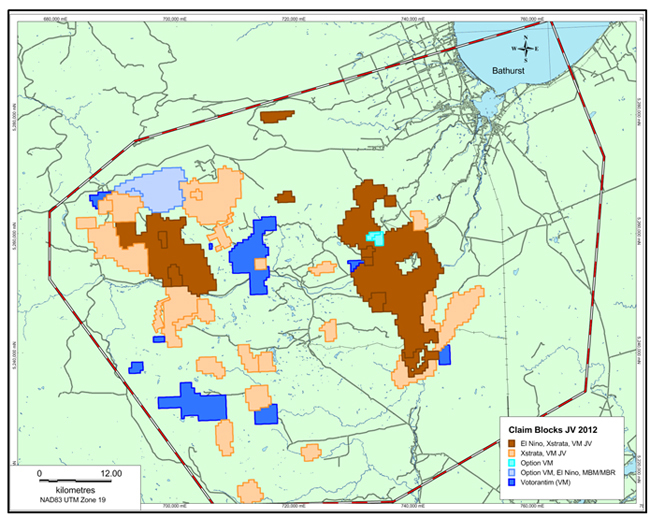 In the early part of 2010, VMC made application to the Government of New Brunswick (GNB) for financial assistance in applying new exploration methods. An Advanced Exploration Agreement between the GNB and VMC was executed in late September, 2010 regarding the implementation of a program that would match VMC's exploration expenditures with GNB contributions. These expenditures are to be no less than $1,000,000 and no more than $2,500,000 per year for three years, for a maximum, total, GNB contribution of up to $7,500,000. GNB expenditures together with VMC's expenditures would therefore result in exploration expenditures of up to $15,000,000 over the life of the Agreement. The effective date for this agreement is April 1, 2010. Votorantim Metals Canada Inc. is a subsidiary of Votorantim Metais; a company that is part of the Votorantim Group that was founded in Brazil in 1918, operates in twenty countries and has over forty thousand employees. Votorantim Metais is the largest electrolytic‐nickel producer in Latin America and one of the world's leaders in the production of zinc, aluminum and nickel.